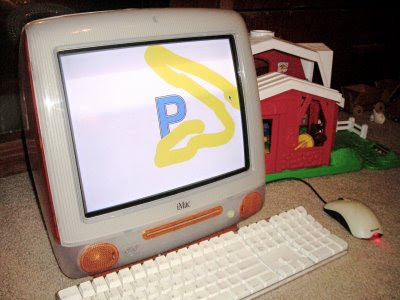 I want to tell you about one of my most favorite Mac applications for kids. It's called AlphaBaby and it's a FREE download. It really came in handy before, during and after our recent cross-country road trip. This application is loaded on all three of the computers in our home. We have a G4 in the office, an iMac in Lucian's room and the MacBook Pro - everywhere. 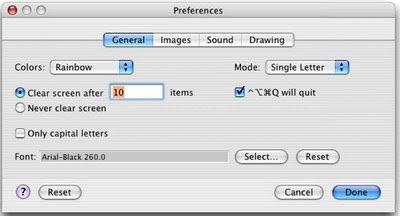 The laptop and the iMac each have a separate user account created just for Lucian with almost identical preferences set. Daddy's G4 has the AlphaBaby icon readily accessible in the Dock. I can not tell you how many times this app has come in handy. You can customize the application for different age groups so when Lucian was an infant, he loved just looking intently at the colors and shapes on the screen. As he got older, I changed the preferences to show letters, colors and lines. Between using this application and a few other online resources, he has learned the entire alphabet before the age of two. This past summer, we went on a cross-country road trip and we drove from AZ to PA and a couple of other states along the east coast. During the trip, Nate drove and I sat in the back seat next to Lucian and entertained him. Having the laptop along for the ride came in handy many times. All I had to do was click onto Lucian's user icon in the menubar and as soon as the cube began to rotate, his face would light up. I could launch AlphaBaby and entertain him for just a while longer until we were ready to make the next stop. During this long, 2-month trip, Lucian got to see and meet many different friends and family members. The last time we flew out to PA, he was only starting to speak a few words and associate faces of people. A year later and he can now comprehend who people are and he is beginning to learn which family members are related to him and how. Now that we're back home, I want him to be able to retain the connections he's made over the summer. 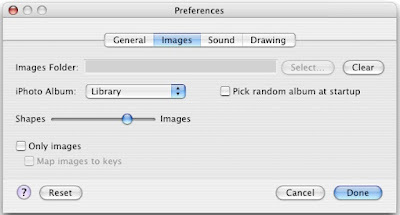 AlphaBaby is a wonderful tool for this because you can set the preferences to allow photos to pop up whenever certain keys are pressed. I didn't, but you can even map certain keys to specific photos. In Lucian's user account in his iPhoto album, I loaded 170 photos of friends and family members. I used photos of people he knows locally as well as far away since we have family and friends all over the world now. I even used a mixture of recent as well as older photos of some of the children as well as side views of people to see if he recognizes facial changes and he does! It's amazing how well he recognizes peoples' pictures and can say their names more and more clearly every time he interacts with this application. Before we came home, he couldn't say the name of his new Aunt Joanna, who likes to be called Aunt JoJo. Now, with practice, Lucian can instantly recognize a picture of Joanna as "An YoYo." We're still working on saying Great Grandmom. It would take some time and effort, but you can, if you want, go into iPhoto and change the title of each picture to the name of the person and then in AlphaBaby, tell it to speak the name of the photo. This works ok, but for harder names, you can imagine the speech to text is not perfect. I prefer us interacting with him while using this application in a flashcard type of way. AlphaBaby will no doubt come in handy for the future as we get new pictures of people that I can add to his iPhoto library. We just got a new baby cousin a week ago and now another cousin is on the way so as soon as I get those baby pictures, I'll add them to his library and AlphaBaby will add them in at random. Learning with AlphaBaby from TheMacMommy on Vimeo. The computer in Lucian's room is an old slot-load 400MHz PowerPC G3 Tangerine iMac with 512MB of RAM and a 10GB HD running Tiger 10.4x. Someone was getting rid of it and Lucian's uncle snagged it for us and replaced the ailing DVD ROM drive and swapped the HD with one from another iMac we scrapped for parts. It's amazing what treasures people throw away! 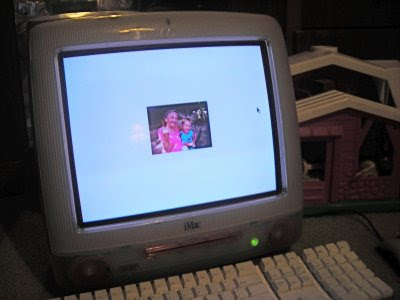 Check your local Craigslist or Freecycle and give an old iMac a good home. These machines make great kids' computers because, with a little TLC, you can upgrade them just enough to run Tiger and a few simple applications. For little ones, this is plenty. This particular model is even capable of utilizing wifi with a built in airport! I don't currently have it connected to the internet because the airport card in it is a little too old to be compatible with WPA2 encryption. One day, I'll get an old wireless router and hook it up just for this purpose. For now, I have an almost identical user account set up for Lucian in my MacBook Pro with almost the same preferences. Under the General Tab, I have it set to just flash one letter or number per key press on the screen and in rainbow colors. Only letters or numbers will show which are mapped directly to the characters on the keyboard. This helps him actually learn keyboarding skills. He is getting better and better about actually pressing the right keys when I ask him to. Right now he's mastering letters and we're slowly incorporating numbers as well. He can almost count to ten. Under the Images Tab, I have the source of the photos loaded from the main iPhoto Library. You can, however, have photos load from a specific photo album or even a folder somewhere else if you're not a fan of iPhoto. I also have it set to randomly load a combination of shapes along with photos since we're still learning colors and shapes. You can see though, I pushed the slider more towards the images since I really do favor photos of people right now since he's learning about family right now too. I love how this operates in a flash card mode. The pictures pop up at random and repeat at various stages. You never know what you're going to get when you press different keys on the keyboard. He could keep pressing the space bar or any other modifier key and it will show a different photo or shape each time. It really helps him with keyboarding skills because he quickly learns that letter keys result in a letter, number keys a number and any other key results in a photo or shape. He is old enough to make deliberate decisions about what to press. He knows that he will get only photos if he presses keys other than letters or numbers and it's fascinating to watch him make those choices! Under the Sound Tab, I have it set to speak the letters using the Victoria voice. It's not perfect, but it's pretty acurate. 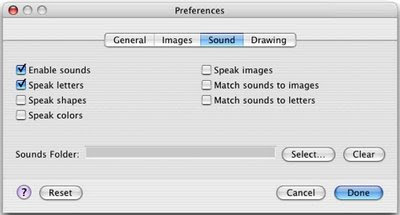 (The text to speech has greatly improved in Leopard 10.5, but for this demo, I'm using the Tiger 10.4 version of the app.) This is the place where I mentioned previously that you can tell it to speak the images. It will convert text to speech by reading the file name of each photo. So, if you leave your photos named DCSN1045, that's what Victoria will say instead of Pop Pop. Under the Drawing Tab, there are many items from which to choose. When Lucian was really little, I used the stars, ducks or trucks because objects were interesting to him. 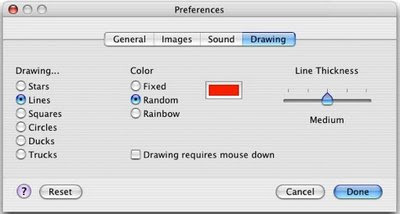 When kids are really little, you'll want to uncheck the box for drawing requires mouse down. This way, all they have to do is push the mouse or move their finger across the trackpad and it will instantly draw a line on the screen. Little ones don't yet have the hand-eye coordination needed to associate with a pointing device. This tool really helps them grasp that concept much sooner because it draws their eye to a simple line draw which allows them to make the connection between cause and effect of the pointing device. This works well whether it be a single or two-button mouse or a trackpad on a laptop. You can also vary the line thickness. As babies begin to develop peripheral vision, the thickness of the line that appears on screen can make a difference in what they see. If you make the line too thin, they probably will not notice it much. If you make the line really thick, they will take notice of it better and realize the cause and effect relationship between the mouse and screen while their head is pointed down and their eyes focused on the keyboard or mouse. This concludes my review of AlphaBaby, the application that allows you to toddler-proof your Mac while making learning fun. I hope you've enjoyed my review and that you'll visit the creator's site and donate a few bucks for their hard work. Does Blogging Keep You Honest?